What’s the importance of readability? 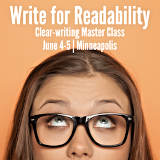 - Wylie Communications, Inc.
Home » Writing tips » Readability » What’s the importance of readability? Read ’em and weep: On average, the U.S. adult literacy rate is basic or below basic. Reading ease: Even highly literate audiences benefit from easier-to-read copy. And what’s dumb about that? Can you read me now? People spend more time reading, read more completely and read more often messages that are easy to read. Can you read me now? Complex messages are not sophisticated, credible and authoritative, researchers find. Eye on the bottom line: How much does bad writing cost your organization?